When we ask transit riders what they want from us, we usually get a simple answer: They want us to show up on time and to get them to their destination as safely and quickly as possible. Bus-only shoulders, dedicated transit lanes and technology that allows buses to request green lights are just a few of the ways we’ve made our service faster and more reliable. But the reality is we still have work to do. Nearly two-thirds of our customers ride on local bus routes that travel, on average, less than 14 miles per hour. One of our busiest routes, Route 21, has an average travel speed of less than 10 miles per hour. We are continually making progress, however. Our next step forward is on our Route 2 corridor, where around two-dozen of our least-used stops are being consolidated (these changes take effect on Saturday, Oct. 13). The hope is that by making fewer stops, buses will get to their final destination a few minutes sooner. The changes come after getting input from customers and Route 2 operators and are part of a larger effort to improve service on one of our slowest local routes. Several new bus shelters have also been installed along the corridor. We’re also excited to soon begin using Transit Signal Priority (TSP) on parts of the Route 5 corridor. With TSP, Route 5 buses will be able to request green lights at 30 key intersections, helping them move faster and more predictably. > Later this month, hundreds of buses will begin using a transit-only ramp connecting downtown Minneapolis and southbound Interstate 35W. When construction is over in a few years, we’ll also enjoy dedicated transit and carpool lanes and a new station at Lake Street. Combined with more frequent service, transit will become an unrivaled option on one of the state’s busiest and most congested corridors. > Our region’s next rapid bus line, the C Line, will open next spring on the Route 19 corridor. Like the A Line, we expect C Line buses to be up to 25 percent faster than existing service by moving fare purchases off the bus, allowing all-door boarding and making fewer stops. As C Line construction enters the final stages, we continue to advance plans for rapid bus lines on busy corridors served by routes 5, 6 and 21. > This summer, we began installing new fareboxes that are more efficient and reliable than the 25-year-old equipment they’re replacing. These machines are coupled with ongoing efforts to promote Go-To Cards and mobile fare payments, which now represent more than half of all fare payments. > On our light rail lines, we continue to work with local partners to get trains safely through intersections without having to wait for a green light. These examples demonstrate a sincere commitment to addressing one of our customers' top concerns. Thank you for riding, and thank you for continuing to give us the opportunity to serve you better. As an organization, we talk a lot about how important transit is to providing access to opportunity. That’s particularly true for people with disabilities who rely on transit to live a full and independent life. Because we want transit to be inclusive, we continually ask ourselves whether we’re doing enough to welcome everyone who wants to ride, regardless of their abilities. Over the past year, we’ve installed level concrete pads at dozens of bus stops to make boarding easier for individuals who use mobility devices. As we’ve installed new and replacement shelters, we’ve also addressed curbs and other physical barriers that make it harder to get to and around these stops. Bus operators going from part- to full-time recently began taking classes in which they use blindfolds and ear protection to experience what it’s like to board and ride the bus without being able to see or hear. Go-To Card readers on all our rail stations and buses have been equipped with audio cues while keyboards on A Line ticket vending machines were designed to better serve individuals with visual impairment. Our new Text for Safety service allows suspicious behavior to be reported through text message, something that is especially useful for people who are deaf, blind or hard of hearing. And just last month, we made it simpler to get a Limited Mobility fare card by removing the requirement to get a special endorsement on a driver’s license or state ID. Our fleet has also steadily become more accessible over the years, with level boarding at light rail stations, buses with roomier interiors on our rapid bus lines and a nearly-completed phase out of high-floor buses. Our system will become even more accessible in the years ahead, too. Responding to customer feedback, future light rail trains will have a more spacious seating arrangement that provides more room for mobility devices. A new station at I-35W and Lake Street will replace a highway-level stop once accessible only by a steep set of stairs with a modern, two-level facility equipped with elevators. Transit Information hopes to test tactile maps, high contrast signs and larger text at select sites to invite feedback and determine if such features should be applied more broadly. Our accessibility improvements directly benefit the roughly 1 in 10 regular route customers who reported having a disability in the Council’s latest survey of regional travelers. But they also make our system better and easier for anyone who rides with us, including children, the elderly and caretakers traveling with strollers. We’ve made a lot of progress in the nearly three decades since the ADA became law, and look forward to making even more improvements in the years ahead. Passenger cars and other vehicles are Minnesota’s second-largest source of greenhouse gases, a leading cause of climate change and air pollution. And while advances in technology have led to a steady decline in vehicle emissions, there’s still a lot more to be done. As an agency, Metro Transit is helping the state meet its clean air goals primarily by offering convenient alternatives to driving alone, providing more than 280,000 rides each weekday. But the commitment to the environment doesn’t end there. In fact, Metro Transit has a well-deserved reputation for being one of the most sustainability-minded transit agencies in the country. The agency has achieved Gold Level status in the American Public Transportation Association's Sustainability Commitment program. > For the past year, we’ve collected compostable materials like food scraps and paper napkins at our Heywood Office, Transit Control Center and Transfer Road facilities. Along with traditional recycling efforts, we’re keeping about two-thirds of what we toss from ending up in the waste stream. We plan to expand these composting and recycling efforts to each of our garages and other support facilities later this year. > By the end of this year, around 75 percent of the fixtures at our support and customer facilities will be equipped with energy-efficient LED lighting. This lighting not only uses less energy but is longer-lasting and less-costly to maintain. > We continue to install small solar panels at waiting shelters to power lighting at these locations. We also continue to explore opportunities to put more solar panels on the rooftops of our support and public facilities (above, panels at the Maplewood Mall Transit Center and Park & Ride). Coupled with the energy we purchase from solar installations at Council-owned sites, we are on track to achieve our goal of having all our energy needs met by renewable resources as early as 2040. > As part of our C Line project, we plan to purchase eight fully-electric buses and install charging equipment at the Heywood Garage and Brooklyn Center Transit Center later this year. We’ll also be adding more electric vehicles to our non-revenue fleet and consider buying electric buses as we replace older vehicles and expand our service. > Fleetwide fuel economy continues to improve, from just under 4 miles per gallon in 2008 to nearly 5 miles per gallon in 2017. We recently began using synthetic engine oil in our buses, a change that allows us to use less oil by doubling the interval between oil changes. New engine technologies and advanced exhaust filtration systems have also significantly reduced the amount of harmful emissions coming from our buses. > The new Metro Transit Police Headquarters will be our most sustainable building ever, with a geothermal system that heats and cools the building, natural lighting and other energy-saving features. Designs for a new service garage north of Heywood also call for a host of energy-saving features. > Later this month, we’ll begin using technology that will allow us to capture and re-use more of the energy produced when Blue Line trains brake, a system that could be incorporated into future light rail extensions. Thank you to all our customers who are doing part to support the environment by riding with us. We share your commitment to the environment and hope to continue building on that commitment in the years to come. 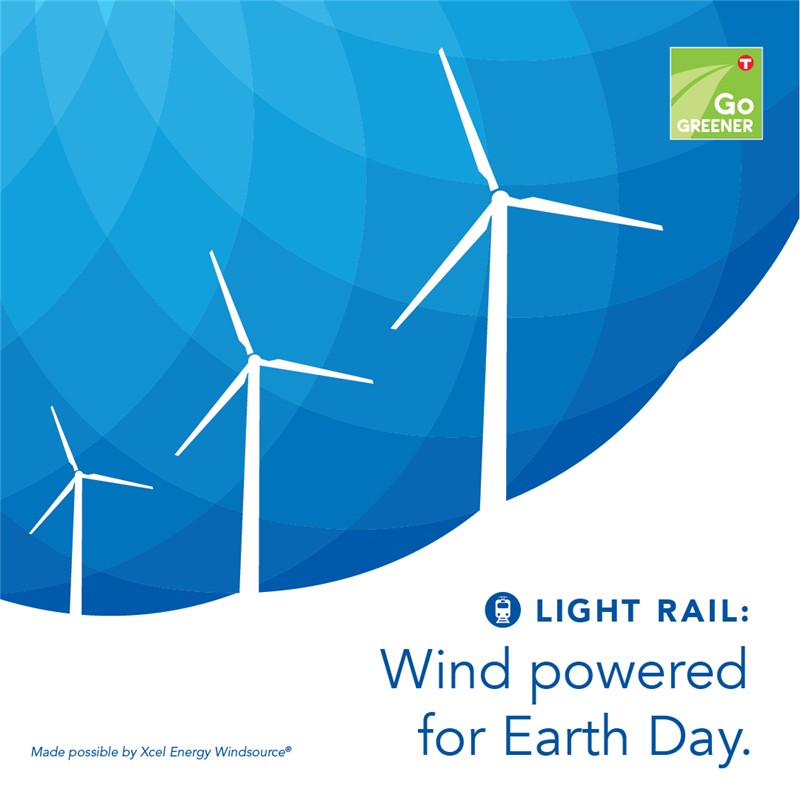 The METRO Blue and Green lines will be operated 100 percent by wind power on Earth Day (Sunday, April 22) with Xcel Energy's WindSource® program. Light rail is always zero-emission travel at the source, since it always operates using electricity. Using wind power for Earth Day makes it a truly sustainable transportation option from the energy source to the vehicle. Make a sustainable choice every day with Metro Transit! A single bus has the potential to take 40+ individual cars off the road and a 3 car light-rail train can remove almost 600 cars from the roadways when people ride. Learn more about our fuel efficient and upcoming all-electric vehicles along with other environmental improvements at metrotransit.org/GoGreener. For the past two years, construction has prevented us from using one of the most important and popular features of our transit network – Nicollet Mall. Moving six of our busiest local bus routes to Hennepin Avenue – bringing 800 more daily trips to a street already full of buses, cars, pedestrians and bicyclists – brought its share of challenges. I want to extend a sincere thank you to everyone who moved with us from Nicollet to Hennepin, and to all those have stuck with us through all of the road and light rail construction downtown in recent years. Hopefully, like me, you’re excited about what all this work means for our city center. The Nicollet Mall project has brought new lighting, more than 200 trees, public art and other improvements, creating a much richer and pedestrian-friendly environment. Later this year, we’ll build on the city's reconstruction efforts by putting in a dozen new shelters with heat, light and real-time displays. Hybrid buses and free rides on some routes will also remain features of our Nicollet Mall service. And while the remake of “Minnesota’s Main Street” is significant, transit improvements are being made throughout the downtown area. We’ve added to our downtown shelter network and spruced up our light rail stations. We’re putting the finishing touches on track and system improvements that will improve light rail operations downtown. And we’ve worked with partners like the Downtown Improvement District on creative placemaking efforts at several of our busiest stops. Next year, construction will begin on a new transit-only access ramp that will make it easier for express and Orange Line buses to get in and out of downtown. Our next two rapid bus lines, the C Line and D Line, will also provide faster, more frequent service to and from downtown. These improvements come at an opportune time. Increasingly, downtown is not just a home to major employers but a place to live, dine, shop or take in a show. The Super Bowl and other future large events will also bring more visitors and attention to our downtown area. With so much going on within just a few square miles, transit is more than a nicety, it’s a necessity. Thank you again for sticking with us through all the recent construction. We hope our customers enjoy the new Nicollet Mall and join us in looking forward to all the other improvements that lie ahead. Nicollet Mall opened in 1968, championed and largely funded by a group of downtown business owners intent on competing with suburban shopping centers like the newly-opened Southdale Mall. It was the first of many transit malls that would eventually be built for similar reasons in large U.S. cities. When Nicollet Mall opened, it was served by routes 17 and 18. Several other routes later operated on the mall, including Route 10, and express buses to Richfield, Bloomington and Minnetonka. Nicollet Mall was also briefly home to a downtown circulator known as Quick Transit, or QT, which began in 1971. The propane-powered QT minibuses ran along Nicollet Mall until 1980. To reduce the number of buses traveling on the mall, express routes were moved to Marquette and Second avenues nearly 20 years ago. Today, the mall is served by routes 10, 11, 17, 18, 25 and 59. Prior to construction, there were around 12,500 average daily boardings on Nicollet Mall. Free rides have been available on select Nicollet Mall routes since 2010 (southbound routes 10 and 59 and northbound Route 18). When people leave their homes, there are a few essential items they’re likely carrying with them, including identification, credit or bank cards and a mobile phone. Less likely to be in their pocket: a Go-To Card or the exact change it costs to board a bus or light-rail train. Confusion about the fare and the need to have the right amount ready to board has long been a challenge for new or infrequent riders, sometimes discouraging them from using transit altogether. Ticket vending machines that accept cash and credit cards at rail and rapid bus stations helped us begin to address this challenge. This week, we took another major step forward as we introduced a new Metro Transit app that allows people to buy and instantly use fares using a smartphone. With the app, customers can purchase mobile tickets in advance and use them when they’re ready to ride. These customers will prove they’ve paid their fare by showing bus operators or police officers a screen with a unique, moving image that can’t be replicated or used after time has expired. Created in partnership with tech company moovel, the app also provides access to our website’s most popular trip planning tools. In the future, it will give customers a simple way to let us know about immediate concerns and to receive alerts about the routes they most often use. Operators and police have been trained to recognize valid mobile tickets over the last several months and a number of employees have successfully tested it in the field over the last few weeks. > Nearly 7 in 10 U.S. adults own a smartphone, and a third have used them to make a mobile payment. Our largest customer group, Millenials, are even more likely to own a smartphone and use it to make purchases. For many low-income residents, smartphones are the only reliable access to online resources. > The Twin Cities has become a top tourist destination, attracting more than 30 million visitors a year. An even greater number of visitors will arrive in the coming years for the Super Bowl and other large events. While special fare products that serve travelers have been introduced, mobile tickets are more immediate and convenient. > About 72 percent of our website’s visits are from mobile devices and 16 percent of fares are sold through our online store. Use of a new service that allows customers to access NexTrip information by text message has grown exponentially since being introduced last June. There are advantages for our operations, too. Cash-paying customers take more time at the farebox when boarding and face longer lines when buying tickets after large events. Customers who use mobile tickets will board just as efficiently as those using Go-To Cards. While there are several clear advantages, the number of customers expected to use mobile tickets is likely to be small – we hope they will account for around 5 percent of all fare payments within the next year. But getting customers to purchase their fares through the app on a regular basis isn’t really our goal. Instead, we want the app and mobile ticketing to move transit up on the list of options people consider when making a trip, eventually earning their trust so Go-To Cards become just as indispensable as their smartphones.